With the New Year come resolutions to improve your life. You might decide to start eating healthier and exercise this year. Or you might set financial goals and vow to get your finances in shape. Sadly, many of you will fail. And fail miserably. But this isn’t because you don’t want to improve your finances or lose weight. It’s because you bite off more than you can chew. In other words, you try to do too much, too quickly. Look at the last time you tried to set financial goals. You probably threw together a budget and decided to stop spending your money on things. This worked well for a few weeks. But then in a moment of weakness you buy something. Then you buy something else. Before you know it, you’ve forgotten about your budget and given up. We could also look at losing weight. To achieve your goal, you buy all sorts of healthy foods, join the gym and get to work. You completely eliminate all bad food from your diet. You start working out for an hour every day. And this works for a few days, as you are motivated and excited to be making a change. But your motivation wears off and you don’t see much change in your physique. So you start to slack. You skip a gym workout and then another. Then you have a cheat meal. Then another. The next thing you know, your goal is forgotten about and you go back to your old way of life. Your current lifestyle is comfortable. You have a routine and even though it is unhealthy, it is familiar and so it works. When you blow up your routine with a new way of eating and adding exercise, you lose that comfort. How do you ever make a change? You make changes slowly. Instead of completely blowing up your life, you make one small change. You follow it for a little while then add another small change. By doing this you slowly change your lifestyle and you allow yourself to get comfortable with it. To get your finances in order, you make it a point to start saving money first. Then after a few weeks, you start tracking your spending. You do one thing at time and take your time. To lose weight, you begin by slowly changing your diet. Once you do this for a few weeks, then you slowly begin to workout. The result is a higher likelihood of sticking with your goals. Instead of completely overhauling your life, you make small changes slowly over time. You still set annual financial goals, but by taking things slower, you increase your chances of success. And this is what this post is going to help you with. By the end of the year, you will see a monumental improvement in your finances. But it won’t happen overnight. It will take time. There is no magic fix that is going to have your finances perfect overnight. Once you accept this as reality, then you can begin with setting realistic financial goals and reaching them. I’ve broken out 12 goals and you will attack one goal each month. This allows you to make change slowly over time and make these changes stick. Let’s get started with setting and achieving financial goals! The beginning of the year is a great time to reflect on the past and prepare for the future. And for the month of January you are going to do just this. You should begin by reviewing the previous few years of your life. What has changed? Have you made progress financially? Have you fallen further behind? Take some time to assess where you are currently. Write down your debt levels and how much you have in savings. Next, start thinking about your future. What are your goals financially both long term and short term? If you are married, be sure to include your spouse in the conversation. Take your time when creating your goals. Write them down and then leave them for a few days. When you come back to them, see if they resonate with you. If they do, you know you are on the right track. If they don’t excite you, it is time to think some more and come up with alternate goals. Once you have your financial goals, be sure to keep them where you will see them. They do no good if you leave them in your head or on a piece of a paper in a drawer. You need to regularly see them so you will remember them. Finally, as you life changes, your goals will change too. This is perfectly fine. Don’t be afraid to reassess and update your goals. Now that you have set both short and long term financial goals, the next goal to tackle is creating a budget. Why do you need a budget? You need to see where your money is going. When you know this, you can better understand your finances. In many cases, you won’t realize how much you truly spend in some areas until you set up a budget. So for the month of February, you are to track your spending. You have many options when it comes to this step. #1. Write down everything. This means taking a pen and paper and literally writing everything down for a month. Then run through your list and categorize everything. #2. Use a spreadsheet budget. Another solution is to set up a spreadsheet budget. My favorite is Tiller. Using their system, your transactions are automatically entered for you. All you have to do is categorize each one. You can learn more by clicking here. #3. Use an app. The last solution is to use an app. By going this route you link up your bank account and the app automatically updates your budget as you spend. You still have to check it to make sure everything is categorized correctly, but this option saves you the most time. Once you track your spending for the month, you can see where you spend your money. Take some time to review your spending habits. Are there areas where you are spending more than you thought? Are there areas that you are wasting money? You can make some small adjustments to your spending now, but the goal is to keep tracking your spending for a few more months. Doing this will give you an even better picture of how and where you are spending your money. If you want to grow your wealth and reach your financial goals, you cannot skip the goal for this month. The good news is that the goal is simple and you can do it in as little as 5 minutes. What is this goal? It is to start paying yourself first. When you pay yourself first, you guarantee that you save money every single month. The reason you aren’t saving anything right now is because you are trying to save whatever is left over at the end of the month. Since advertisers are good at their jobs, they get you to buy things you don’t need and as a result, you rarely have anything left at month end to save. #1. Invest in your 401k plan. If you have the option of a 401k plan at work, take advantage of it. Save as much as you can in here. #2. Have your employer split your paycheck. Another simple option which can be done along with the above tip is to have your employer split your paycheck. This involves you filling out a form and having a certain dollar amount or percent going to a separate savings account. #3. Take a DIY approach. If your employer doesn’t offer either of the above, you can do it yourself. For investing, you can open a Roth IRA with Wealthsimple and begin saving for your retirement. You can click here to get started. Additionally, you can log on to your bank account and set up a transfer on a specific day each month to have money transferred to a savings account. And if your current bank isn’t paying you interest, be sure to look into CIT Bank. They offer one of the highest yields on savings and this means your money will grow faster. I can’t say enough good things about them. By making it a point to save first, you ensure that you will be getting ahead financially. This of course assumes you live within your means and don’t go into debt each month. And speaking of debt, this is your next financial goal to attain. If you are in debt, this month will have you start to tackle it so you can be debt free one day. To get started, you first have to get organized. So take out a piece of paper and write down the debts you want to pay off. This doesn’t have to be every single debt you have, just the ones you want to pay off first. Once you have your debt identified, you can create a plan to begin paying it off. I prefer the snowball method as it helps to keep you motivated to pay off your debt as fast as possible. With this method you list your debt in order of smallest balance to largest and pay the minimum on everything but the smallest debt. You pay as much as you can on this debt until it is wiped out and then you focus on the next smallest debt. Keep following the plan until you are out of debt. And don’t be discouraged if it seems as though it will take a while to pay off your debt. In the coming months you are going to do some work to make getting out of debt much easier. As we enter into May, you have a budget you are following, you are saving first, and you have a plan to get out of debt. Now comes time to find ways you can slash your spending. When you slash your spending you will have extra money to put towards debt or to save. To get started, you need to pull out your budget. You will have a few months worth of spending which helps to weed out any expense that is not reoccurring. For example, maybe your travel budget was higher one month because you attended an out of town wedding. I want you to look over your budget and find expenses that surprise you. Chances are you can take action to cut back on these areas. For example, maybe you are shocked at how much you spend dining out. Simply decide to cut out one or two meals that you eat out a month to free up some money. The goal here isn’t to completely eliminate a spending category. Just reduce it a little bit. By making a small change, you won’t notice it and will be more likely to stick with it. Once you run through your budget looking at expenses that surprise you, the next step is to try to cut down on your big expenses. These include your mortgage or rent, taxes, insurance, cable, and groceries. Let’s take a closer look at each one. If your mortgage is too much, you have some options. Your first option is to try to refinance. When you refinance, you end up with a lower monthly payment. You can play around with the calculator below to see how much you could save each month. But refinancing doesn’t work for everyone. So you might have to look at other options. These include everything from potentially moving to a more affordable house, to working a side gig to help you get to the point of refinancing. If you rent, you may have to bring a roommate in to split the cost or even move to a cheaper apartment. Additionally, you could negotiate with your landlord. If you make payments on time and don’t cause a lot of hassle, your landlord may agree to keep your rent the same instead of raising it. This is because it is cheaper to keep you than to it is to find another tenant and potentially go months with an unoccupied unit. Taxes eat up a large chunk of your money. But you have some control to keep the amount of taxes you pay in check. First, make sure you are contributing to your 401k plan at work. When you contribute, the money is taken from your paycheck before taxes. This means you pay less taxes overall. Next, look into a flexible spending account. The idea here is the same as above. Putting money in this account lowers your taxable income. If you are covered by a high deductible health plan, then put more money into this account to save on taxes. From there, look at any investments you have outside of retirement accounts. Be sure to limit your bond holdings in these accounts as the monthly income is taxed at a higher rate. You should have your bond holdings in a retirement account and more of your equity holdings in your taxable account. Another tax to look into is your property tax. Are you paying a lot more than others in your neighborhood? If so, you can appeal to lower your property taxes. Finally, take some time to learn the tax code. I’m not suggesting you study it and become a pro. But know the basics so you can make smarted decisions that will help you to save on your taxes. Don’t make the mistake of thinking you are getting the best deal on your auto and homeowner’s policies. You’ll see in a little bit why this is so. But for now, pull out your policies and get a free quote to see just how much you could save if you switch. As a cable subscriber you see your monthly bill increase on a regular basis. The reason for this is simple. It is easier for the cable company to keep an existing customer than to find a new one. As a result, they offer the best deals to new customers. Since existing customers are lazy, the cable company feels comfortable raising prices without worry. But you can fight back. The easiest thing to do is to negotiate. Call your cable provider and find the retention department. Tell them you need better pricing or you are leaving. It helps to have an offer from another provider in your area but isn’t required. From there let them make you an offer. Then decline it. The reason is because the first deal is rarely the best deal. They just want you to think it is a good deal. So they offer you all the channels for a few dollars less than you are paying now. On the surface this sounds like a steal. You are getting a ton of extra channels! But that isn’t your goal. Your goal is to pay the least amount possible. So tell them thanks but you need more savings. Here is how this played out for me recently. The first deal was a savings of $10 a month for more channels. I declined and the next offer was essentially the same package I currently had but for $50 less a month. I ended up taking this deal. You might not get this great of a deal on their second offer, but you can decline it and ask for a better deal. And remember, you can decide to not accept anything and try again the next day with a different rep. If you don’t have time to negotiate or don’t like negotiating, consider using Trim. This service will work on your behalf to get you a deal. They tout a 70% success rate, saving on average $30 a month. You can click here to try Trim. Another big expense for many is groceries. Luckily there are some simple things you can do to save money on your bill. For us, we tried a couple stores and found the one that typically has the best prices. As a result we shop there the most. But we still review the sales fliers of the other stores just in case their sale is a better deal. And when we find a great sale, we stock up. When you find a great sale, make note of it. Stores tend to run their sales over and over, so you can wait to stock up during the best sales. I make it a point to concentrate on these expenses first since lowering them has the greatest impact on our bottom line. But we don’t ignore the little expenses. Take the time to review these as well and see where you can cut back a little bit to free up extra money. As we enter the halfway mark in the year, it is time to look at your retirement contributions. How much are you saving each time you get paid? Are you saving anything at all? Your ultimate goal should be to get your contribution rate to 15% of your income. Doing this will allow for you to build a sizable nest egg for retirement. 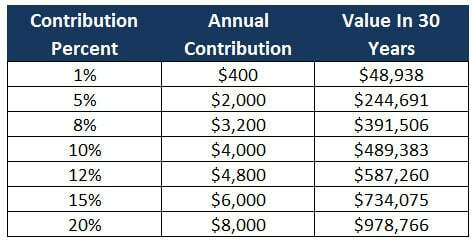 Here is a chart of various contribution percents growing at 8% annually for 30 years on a $40,000 annual salary. Now you can see why you need to get close to saving 15% of your paycheck. But if you are saving 2% right now, don’t let that number discourage you. Simply make a plan to start progressing towards it. Right now, I want you to save 1% more towards your retirement plan. If you are making $40,000 a year, this comes to $15 per paycheck, assuming you are going from 2% to 3%. And after you took the steps above to slash your spending, you should be able to afford to save $15 extra each time you are paid. To increase your contribution, you can log into your 401k plan if you have online access and make the change there. Otherwise, reach out to your benefits specialist and get the form you need to complete. Since increasing your 401k contribution is going to take you 10 minutes, I am including a second goal this month. It is to increase your income. When you increase your income, you can pay even more towards your debt, build your emergency fund faster, or save for a vacation. The choice is yours. And when it comes to making more money, the choices you have are also up to you. You can do some simple things that don’t require much time or effort and make a few hundred dollars every month. Here is a run down of my favorite ideas for you to get started with. #1. Swagbucks. I love Swagbucks because I can take surveys and watch videos to earn points, and I can earn points by shopping online. I then convert these points into cash, though the option is there for gift cards too. I regularly make $25-$50 a month with Swagbucks. You can join for free and get $5 in the process. Click here to get started. #3. Uber Eats. If you want to make decent money, look into partnering with Uber Eats. Your job is to deliver food to customers in your area. You set your own hours and work as much or as little as you want. It’s the perfect side gig to make money. Click here to start the application process. #4. Ibotta. Ibotta is an app that give you cash back when you use it. Just scroll through the offers and pick the ones you want. Then after you shop, you scan your receipt and earn money. They offer tons of bonuses all the time too. New users get $5 when you redeem $10 worth of offers. Click here to get started. #5. Decluttr. Do you have old video games and movies laying around? What about old cell phones? You can sell these items to Decluttr for money. And if you take this one step farther, you can buy items at yard sales for cheap and resell to Decluttr to make money. Click here to get started. You can also check out this great course to making money on the side. It will walk you through the steps to ensure you make up to $1,000 every month. Chances are you rarely review your insurance coverage. This can get you into a lot of trouble in a few ways. First, it almost guarantees you are overpaying for your coverage. Second, as your life changes, so do your needs. As result, you might have insurance you no longer need or you might not have coverage that you do need. Let’s start first with overpaying for insurance coverage. While you might think you are getting a good deal by being loyal to your homeowner or auto insurance carrier, the reality is you are not. You need to shop around to get the best deal possible. It’s the same idea with your cable that I talked about above. But not only do you need to shop around, the greatest savings will come when you bundle your coverage. This means you pick one insurance provider for your auto and homeowners coverage. Doing this gives you discounts you otherwise can’t get. So take the 15 minutes and get a free insurance quote. Then compare it against what you are currently paying. When I compare, I make sure to have my policy in front of me so I ensure I am getting the same or better coverage. You should be shopping around every 2 years. When we do this, we typically save around $250 a year. Once you get a better deal on your auto and homeowner insurance, it is time to look at other types of insurance. This includes medical, disability, life and umbrella insurance. For most, you have medical insurance through your employer or your spouse’s employer. Take some time to review any changes in your health and to see how much you used your insurance. When the time comes for open enrollment, you might be able to downgrade your plan if you don’t use your coverage too often. With life insurance, make sure you are only buying this if you have someone who is dependent on your income. If you are single without any kids, then you don’t need life insurance. Along the same lines, you don’t need a life insurance policy on your kids. Even though they tell you these plans will build up a cash value that you can use for education expenses, the hidden fees and limited growth make these plans a win only for the insurance salesman. If you really want to save for your kid’s education, open a 529 plan. As for disability insurance, this is one type of coverage most people ignore. Sadly, the greatest risk you run with your health is not dying young but rather getting disabled. Because of this, it makes sense to look into this type of coverage. Finally, if you have substantial assets, consider getting an umbrella policy. This insurance covers you personally up to $1 million in damages. So if someone falls in your house and sues you for $1 million, your umbrella policy will cover you. While you do have coverage for this event in your homeowner’s policy, the covered amount is typically much less. While talking about your death isn’t enjoyable, death is a reality and you need to take the steps to get your estate in order before this happens. There is absolutely no reason why you shouldn’t have your estate in order. This is true even if you are single and have no kids. So what documents do you need to make sure you have? Here is a basic rundown. #1. Will: this explains who gets what and how you want your belongings split up. Having this limits family fighting and ensures the people you want to have your belongings get them. #2. Durable Power of Attorney: this document allows a person you assign to act on your behalf in the event you are unable to. For example, if you become disabled, the named agent on your Power of Attorney document can transact financial business on your behalf. #3. Healthcare Power of Attorney: this document is the same as the above with the main difference being the named agent can make healthcare related decisions for you. For example, if you are in a vegetative state, they will decide if you should continue to live or not based on your wishes. By having these documents completed, you can be assured that your estate will be divided based on your wishes. This month your financial goal is to simply get organized. Doing this will have a powerful impact on your finances, your health and well-being, and time. Begin by going through the drawer where you have all of your financial statements and records. You are going to sort through everything and make two piles: a keep pile and a shred pile. With the shred pile, you are simply going to shred these financial statements. If you don’t have a shredder, here is the best one on Amazon. Alternatively, you can see if there is a shredding event in your county and take your financial statements there to shred. For the keep pile, you will want to organize this into a short term and long term pile so you can better organize everything. Simply take anything that is from the current year and put that on one pile and everything older than one year on another pile. By taking the time to get organized, you save yourself time because you don’t have to waste time looking for things and you save time when you have to get everything together for taxes. You also clean out your house, which will benefit your well-being. And finally, by being organized, you can make smarter financial choices going forward. As the end of the year approaches, it is time to look back over the year and the financial goals you set. You want to see where you are making good progress and where you might be falling short. If you are falling short, don’t give up. This is a process and you have to remember life happens. You aren’t going to hit every single goal all the time. This is why your goal for this month is to review. Take some time to see where you are succeeding. Is there anything more you can do to increase your rate of success? For example, if you slashed your spending, can you find additional ways to reduce your spending more? For the areas that you are falling short on, take some time to look within. Why do you think you are falling short? Is your process flawed? Were you just too busy and the goal fell through the cracks? The more information you can collect on why you failed, the better plan you can create going forward so that you can succeed. For example, maybe you failed at creating a plan to get out of debt. When you look back, you see that you failed because in April you had a big work project and you were traveling a lot. 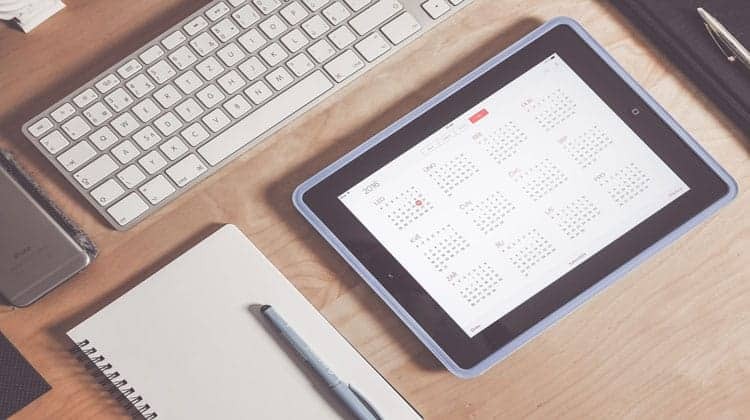 The solution going forward is to make note of when you have a big project or are traveling a lot for work and schedule in a 30 minute meeting with yourself for your finances. As your investments grow in value and the stock market fluctuates, your asset allocation gets out of whack. So while you may have started out with an allocation that was perfect for your risk tolerance, chances are your portfolio needs some tending to. Think of it like a garden. You put in the work to plant the seeds, water your garden and fertilize it. But after some time, weeds start to grow along with your plants. If you don’t check in on your garden and pull the weeds, you are going to have a tough time growing your plants to their full potential. Your investments are the same. If you began with a 60% stock and 40% bond allocation, odds are it is now something like a 70% stock and 30% bond allocation. This extra risk can have a serious impact on your long term growth. As a result, you need to get your portfolio back in line. November is the perfect time to do this since year end capital gains and dividends have yet to be paid out. But first we need to take a step back. If you have retirement accounts, rebalancing is simple. All you have to do is sell your overweight investments and buy your underweight investments with the proceeds. This can be done since there are no tax consequences when you sell in your retirement accounts. Depending how out of whack your portfolio is, it can make sense to turn off the automatic reinvestment of capital gains and dividends and let this money go to cash. Then you can invest it into your underweight holdings. Just be sure to turn your reinvestment back on when the new year comes. You have accomplished 11 financial goals so far and have one more to go. This one it critical as becoming a victim of identity theft can destroy your finances and will cause you an incredible amount of stress. You begin to protect yourself from identity theft by reviewing your credit report. You can do this for free by visiting AnnualCreditReport.com. By looking at these 3 items, you will get a sense as to whether or not your identity has been compromised. But even if you see something odd, don’t assume you are a victim. It could simply be a typo. Be sure to reach out to the reporting agency and dispute the error. Make sure you set a reminder going forward to check your credit report annually. For an additional layer of protection, you can opt to freeze your credit. When you do this, you will prevent any type of credit being opened in your name. The catch is this includes you. So if you freeze your credit, you will have to unfreeze it in order to take out a mortgage or a car loan, or even open a credit card. Additionally, some states require you pay to freeze and freeze your credit. Be sure to review this list to get an idea of how much it will cost you. Note that if you are a victim of identity theft, there typically is no charge to freeze your credit. Remember, you have to freeze your credit with all 3 reporting agencies. So, there you have one year’s worth of financial goals. By taking big financial goals and breaking them down into smaller monthly goals, you increase the likelihood of you achieving your goals. And chances are when you follow this plan I outlined, you will see greater overall progress than you otherwise would. This plan covers your entire financial life and gets it in order in one year’s time. The best part is you can use this list of financial goals every year. The first year you will get everything in order. Then in future years, you can use it as reminders to review your finance and make any changes. Don’t make the mistake like many others and try to do too much come January. Take your time and break your goals into smaller manageable pieces. This will allow you to stick with it longer term and result in greater success overall.